I will have a booth this weekend at the INMAN PARK FESTIVAL (4/24-25). As many of you know, this is one of the most unique and fun festivals in Atlanta, complete with a funky parade on Saturday. But, do you know anything about the history of this historic neighborhood? 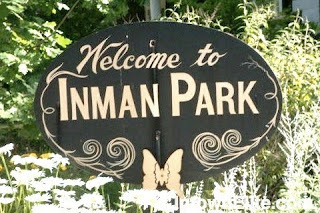 Because the lots were first auctioned off in 1889, Inman Park is considered the first suburb developed in Atlanta. The Battle of Atlanta was fought primarily along the swatch of land from the Carter Center on through Inman Park to Dekalb Avenue. (see The Atlanta Cyclorama. Inman Park was originally developed by local entrepreneur Joel Hurt. He envisioned a country-like neighborhood adjacent to a business district. He managed to achieve this by having larger lots, curving streets and open park areas (this was to be repeated several years later in Druid Hills, also originally developed by Joel Hurt). Because this area was home to so many prominent Atlanta families, easy access to downtown Atlanta was needed.. Thus, one of the nation’s first streetcar systems was founded by Joel Hurt, running from downtown to the Trolley Barn (pictured below), which stands today on Edgewood Avenue, one block south of the Inman Park Marta Station. 10 acres were set aside and Springvale Park was landscaped, complete with Crystal Lake. This became THE place to live in Atlanta. But, unfortunately, the area went into decline in the early 1900’s and continued until the 1970’s. When the automobile became more commonplace, people began moving away, new suburbs further away were developed. Apartment homes were being built. 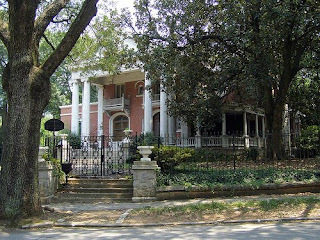 Many of the wonderful elegant homes in Inman Park were owned by absentee landlords and thus divided into apartments. Crystal Lake was eventually drained because it was filled with weeds and gargage and had become mosquito-ridden. But, luckily urban pioneers discovered the neighborhood in the 1970’s, and Inman Park Restoration Inc was formed. Within a year, 40 houses were being renovated to their original luster. 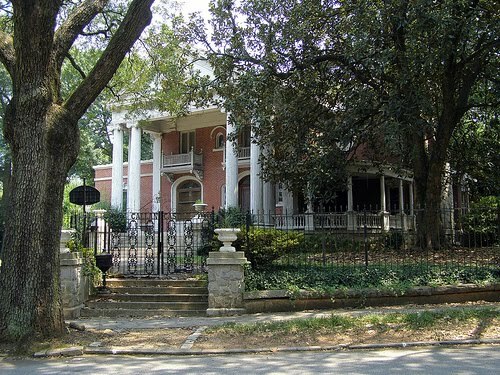 Then Inman Park did something that had rarely been done before, the entire neighborhood was zoned back to residential and in 1973 was officially listed on the National Register of Historic Places. 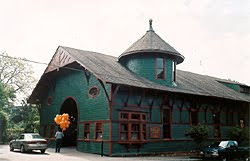 To learn more about the history of Inman Park , The Atlanta Preservation Center conducts tours April-October. This entry was posted in Around Atlanta, My Exhibitions on April 20, 2010 by vickiemartin.